Dunkin’ Donuts Korea has come up with the most unexpected mash-up: a Tteokbokki Donut. 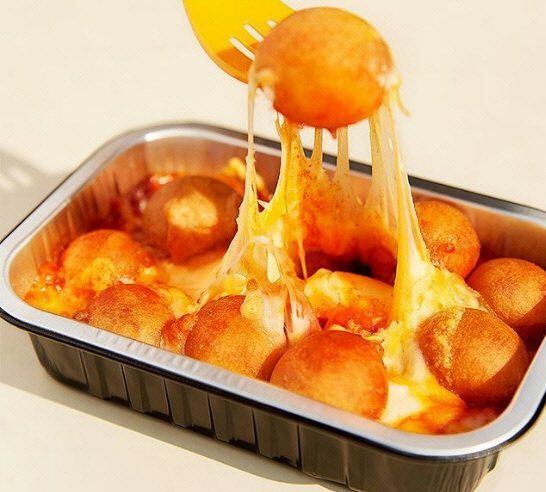 Created in cooperation with one of the leading Tteokbokki franchises, Jaws Tteokbokki, Dunkin’ Donuts’ new release comprises chewy doughnut holes and fish cake pieces, dipped in sweet and spicy tteokbokki sauce and covered with cheese. Using chewy dough, the tteokbokki-flavored donuts reenact the texture of rice cakes used in the original dish. Provided by Jaws Tteokbokki, the sauce is made sweet enough to be enjoyable to anyone. Reviews say that the product tastes unexpectedly harmonious. Tteokbokki Donuts will be available through this month at local Dunkin Donuts stores in Korea.